Acrylic Paint - Acrylic paint is a durable paint that has pigments suspended in an acrylic (or plastic) binder. If you are striving for all natural paints for your toys, please be aware that acrylic paints are plastic based and not natural. However, they come in a wide range of vibrant colors, are color fast, easy to apply and clean up and have no fumes. 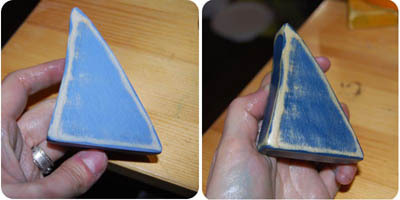 They can even be mixed with water to create a "wash" of paint, as in the tree example in the photo to the left, which shows the wood grain beneath. Not all acrylic paint is created equally however! Not all acrylic paint is non-toxic or safe for toys either! Please read paint labels and look for the "AP Non-toxic" seal. Do NOT use paints without this seal. Some artist's paints have mercury, arsenic and cadmium in them for pigments and you absolutely do not want these ingredients on your toys. Milk Paint - Milk paint is one of the few 100% natural paint finishes for wood. True milk paint uses a cow's milk protein (casein) as the binder. It is odorless when dry and completely biodegradable. It comes in a powder form that you mix with water. More water will create a wash effect showing the grain while less water will create a thick, opaque matte paint. Please be aware that some people are extremely allergic to dairy, including cow's milk casein and could potentially be allergic to milk paint. Milk paint however does need to be sealed with something to protect it from water, otherwise it will spot. Above is a before and after photo of beeswax over milk paint. Using a natural sealer over the milk paint will result in a darkening and deepening of the paint color. It also results in a 100% natural toy! Here is more information on natural finishes for wood that you could use as a sealer over milk paint. Watercolors - You can also paint wood with watercolor paint, which will leave a subtle wash of color, almost like a stain because the grain of the wood shows through. Watercolors use plant gums as a binder (unlike acrylic paint which is a plastic binder) and because of this the paint is forever watersolulable. The trick is to use enough that it absorbs into the wood, like a stain. Toys painted with watercolors should be sealed to keep them colorfast. Just like acrylics, some watercolors are non-toxic and some are not safe for toys. Look at paint labels and only use those with the "AP Certified Non-toxic" label. The turtle image and design is ©Woodmouse Loves Wood. More woodmouse toys can be found on Etsy at Woodmouse Loves Wood. Food Coloring - Several readers have emailed asking if you can use food coloring or even Kool-Aid as a wood stain. The hope is that since it is edible it is safe to use on toys. You can! I mixed a gel food coloring with a few drops of vinegar (vinegar is the acid that helps set the dye on natural fibers such as wood) and I also tried mixing powdered Kool-Aid with vinegar to create a paste. Kool-Aid leaves only a very faint stain (both purple and blue will look more grey) and it is harder to get vibrant colors. I don't recommend using food coloring on your wooden toys because it stains. Everything. My hands were stained for two days. You have to sand the wood afterwards and wipe down with a cloth to remove excess color (very messy) and because there is no binder to hold the color on the wood will "bleed" color forever. As a test, a week later I rubbed the dry block on a white cloth and sure enough, it left a blue streak. Not exactly something you'd want laying around on your rug or on your child's toys. You could of course seal the Kool-Aid or food coloring with a polyurethane varnish but that really defeats the purpose of using a "natural" and "non-toxic" finish on your toys. Don't be fooled by "water based" varnishes, they are not natural. You might as well use another type of paint! Enjoy choosing finishes for wood toys!